Following are popular data points and sources frequently requested from the U.S. Department of Energy when planning, evaluating, or marketing residential energy efficiency programs. 1. How much energy does the residential sector use, compared to total U.S. energy consumption? Households accounted for 21.8% of total energy consumption in the United States in 2014. Calculations based on data from: Annual Energy Outlook 2016, Table 2: Energy Consumption by Sector and Source, U.S. Department of Energy, 2016. 2. How many households are there in the United States? How many are new homes? In 2014, there were approximately 114.8 million households, averaging 1,686 square feet. Of those, approximately 70% - 80.08 million - were single family homes. Calculations based on data from Annual Energy Outlook 2016, Table 4: Residential Sector Key Indicators and Consumption, U.S. Department of Energy, 2016. Approximately 15.6 million homes were constructed between 2000 and 2009, about 14% of all households in the United States through 2009. Source: Residential Energy Consumption Survey 2009, Table HC2.3: Structural and geographic characteristics by year of construction, U.S. Department of Energy, 2012. 3. How much energy does the average U.S. household consume? How is this energy used? The average U.S. household used 90 million British thermal units (Btu) in 2009, or nearly 50% more energy than the average car in a year. Homes built since 2000 use only 2% more energy on average than older homes, despite being on average 30% larger. Source: “Newer U.S. homes are 30% larger but consume about as much energy as older homes,” U.S. Department of Energy, 2013. 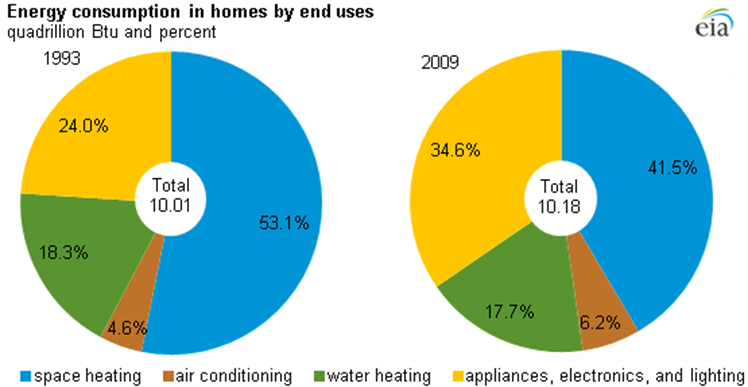 Of the energy used in U.S. homes in 2009, 48% of it was used for heating and cooling. Water heating, appliances, electronics, and lighting accounted for the remaining 52% of total consumption. Source: “Heating and cooling no longer majority of U.S. home energy use,” U.S. Department of Energy, 2013. 4. What are average U.S. household carbon emissions per year? In 2014, an average household used energy that released an estimated 21,355 lbs. of CO2. To put this number in perspective, the average household is responsible for releasing more than twice as much CO2 emissions as the average car per year. Calculations based on data from: Annual Energy Outlook 2016, Table: Energy-Related Carbon Dioxide Emissions by Sector and Source, U.S. Department of Energy, 2016. 5. 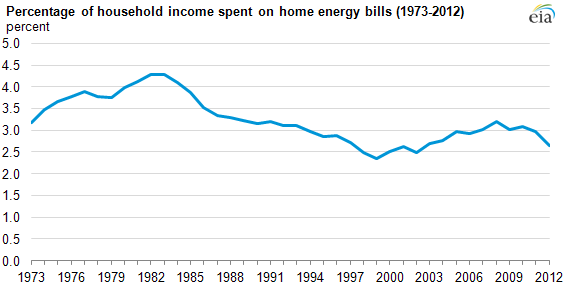 What does the average U.S. household spend per year on its energy bills? In 2012, the average U.S. household spent $1,945 on heating, cooling, appliances, electronics, and lighting. Source: “Lower residential energy use reduces home energy expenditures as share of household income,” U.S. Department of Energy, 2013. 6. What is the average age of heating systems in U.S. homes? Approximately 74% of U.S. households reported an average age for home heating systems of 5 years or more in 2009. About 32% of households report home heating equipment older than 15 years. 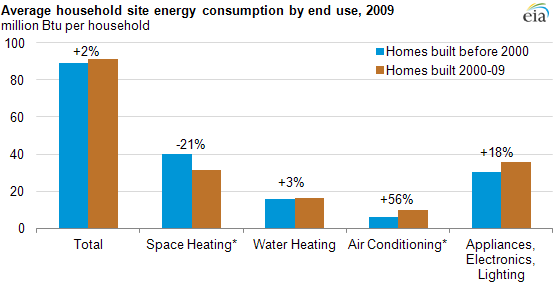 Calculations based on data from: Residential Energy Consumption Survey 2009, Table HC6.1: Space heating by type of housing unit, U.S. Department of Energy, 2012. 1. How much energy savings is typically identified in a home energy assessment? How much does an assessment cost? Consumers can save 5-30% on their home energy bills by making home energy upgrades typically identified in a home energy assessment. The typical cost of a diagnostic home energy assessment is $300-500, depending on the local environment and home performance market conditions. Source: #AskEnergySaver: Home Energy Audit, U.S. Department of Energy, 2014. 2. What are some simple ways to reduce heating and cooling costs that don’t involve major upgrades? Households can save as much as 5-15% a year on their heating and cooling bills by simply turning their thermostat back 10⁰ to 15⁰ for 8 hours a day. Source: Energy Saver, Thermostats, U.S. Department of Energy, 2013.
during the summer, keep your window coverings closed during the day to block the sun’s heat. Source: Energy Savers Guide, U.S. Department of Energy, 2011. 3. How much can a homeowner save by installing insulation and reducing air leaks? Increasing a home’s insulation and reducing air leaks is one of the most cost-effective ways to reduce energy waste. Proper insulation and air sealing techniques can typically achieve whole-house energy savings of 10-20% over pre-upgrade energy usage. In older homes and homes with little or no insulation, savings may be much higher. Source: “Energy Renovations: Insulation, A Guide for Contractors to Share with Homeowners,” Building America Best Practices Series, Vol. 17, U.S. Department of Energy, 2012. 4. How much savings are possible through upgrades to home heating and cooling equipment? Upgrading a home’s heating and cooling equipment can reduce energy use by up to 20% or more, depending on the condition of the existing systems. Similar savings may be realized by improving the distribution efficiency of the heating and cooling systems. Source: “Energy Renovations: HVAC, A Guide for Contractors to Share with Homeowners,” Building America Best Practices Series, Vol. 14, U.S. Department of Energy, 2011. By combining proper equipment upgrades with recommended insulation, air sealing, and thermostat settings, homeowners can save about 30% on their energy bill. 5. What savings are possible through making my windows more efficient? An estimated 10-25% of an average household heating and cooling bill escapes through leaks associated with windows. By installing exterior or interior storm windows with weatherstripping, homeowners can reduce heat lost through the windows by 25-50%. Installing a low-emissivity (low-e) storm window over a low performing window can reduce a home’s heating and cooling costs by 10–35% annually. Source: “Performance Validation of Low-e Storm Windows Paves Way for Market Acceptance,” U.S. Department of Energy, 2015. Looking for more Residential Energy Data? Administered by the U.S. Department of Energy’s (DOE) Energy Information Administration (EIA) every five years, the RECS is a national survey of residential housing units. Interviewers collect energy characteristics on each housing unit participating in the sample, including usage patterns, household demographics, and household characteristics. The latest RECS is based on data collected in 2009 and includes multiple state profiles. Projections in the Annual Energy Outlook 2016 reference case focus on the factors that will shape U.S. energy markets through 2040, under the assumption that current laws and regulations remain generally unchanged throughout the projection period. The early release provides a basis for examining and discussing energy market trends. Administered by DOE’s Office of Energy Efficiency and Renewable Energy (EERE), this tool provides energy market information that can help state and local governments plan and implement clean energy projects, including: city electricity, natural gas, and fuel use estimates; electricity generation; fuel sources and costs; applicable policies, regulations, and financial incentives; and renewable energy resource potential. Search by Zip Code or City to get summary reports or use the Toolbox to browse community energy actions. The 2011 Buildings Energy Databook includes statistics on residential and commercial building energy consumption. Tables contain data related to construction, building technologies, energy consumption, and building characteristics. The Building Technologies Office within DOE’s Office of Energy Efficiency and Renewable Energy developed this resource to provide a current and accurate set of comprehensive buildings- and energy-related data. The Energy Savers Guide informs homeowners on ways to cut energy use in their homes with easy, practical solutions. These solutions include upgrades to a home, using home appliances and other equipment more efficiently, and more.